Photograph taken by John Trotter (Radio Operator). 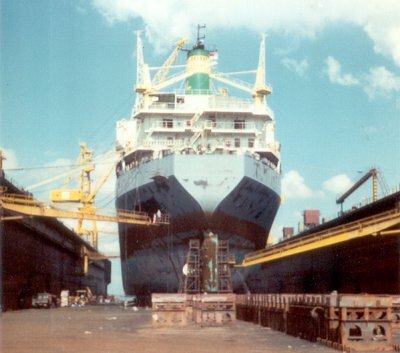 Sembewang drydock Singapore, 1985. Loading Phosphate at Nauru 1985. (John Trotter). Tonnages: 20,819 gross, 11,509 net, 31,992 deadweight. Main Dimensions: 557.8 x 88.7 x 48.7 feet. Cargo Handling: Fitted with four deck cranes 0f 18 tons SWL suitable for grab handling. December 1976: Completed by Mitsui Engineering & Shipbuilding Co. Ltd., Chiba, Japan ( Yard No.1093) for Woodstock Ltd. (Lyle Shipping, Glasgow) Scottish Ship Management Ltd., Glasgow, managers. Bareboat chartered to British Phosphate Commissioners. 1977:	Owners became Cape Otway Ltd., same managers. 1978:	Owners became Otway Shipping Co. Ltd., same managers. 1987:	Sold, K/S Hansa Bulk 2. Barber International A/S managers. Renamed HANSA MARINER. Norway (NIS) flag. 1988:	Sold K/S Stamariner. Helmer Staubo & Co. managers. Renamed STAMARINER. Norway (NIS) flag. 1993:	Sold Shipping Enterprise, renamed TAMARINE. Malta flag. 1998:	Sold, Golden Union Shipping Co. S.A. Panama flag, renamed FLAG BRAVEHEART. 2000:	Sold, Flag Sofia Shipping Ltd. renamed FLAG SOFIA. Malta flag. November 15th Reported as being on fire at St Petersberg. Damage to the Officer’s Dining Room, laundry and alleyways. 2002:	Sold Emirates Shipping Corporation Ltd. Emirates Trading Agency LLC, managers. Renamed PEARL OF ASMAN then amended to PEARL OF AJMAN. Malta flag. 2003: March 25th. Broken up at Alang, Bangladesh. The Last of the "Capes"
With the change of registry ot the Cape Otway in Brisbane last year and a change of name to become the Norwegian owned Hansa Marina, the famous "Cape" name disappeared from the world shipping scene after more than 140 years. The Cape Otway, with the Cape Hawke and the Baron Murray, were acquired on charter when ANL took over the phosphate trade from Christmas Island in 1981 from the British Phosphate Commission. The Queensland shipping publication "Brisbane Portrait" reported that, in June 1987, the business started by the Lyle brothers in Scotland in 1835, faced with insurmountable financial problems, went into liquidation, and Acomarit Maritime Services UK Ltd. acquired the Lyle ships. From the time the company was formed, until the 1960's, every ship carried the "Cape" identity. In 1967 the Lyle group amalgamated with H. Hogarth and Sons to create Scottish Ship Management. At first, the partnership prospered, but, by the early 1980's, the combination of falling freight rates and rising costs had the line in serious trouble. Lyle withdrew from the partnership, but the situation deteriorated and the receivers were called in in 1987. The Hansa Mariner, now owned by Hansa Bulk Norway, took a cargo of coal to Japan after her renaming.